Tsugaru-Jamisen is a style of Shamisen originating from Aomori-ken, Japan! Please watch, listen, and enjoy! Donate to Friends of Aomori! If you would like to support Friends of Aomori, a 501(c)(3) charitable nonprofit organization, please feel free to make a donation! You may fill out a secure, online form through JustGive.org by clicking on the image below! If you have not already and would like to get involved with our organization, please contact us by filling out the contact form on our website here! Interested in Traveling to Japan this Summer? The Bath-Tsugaru Sister City Program is sponsoring a travel exchange group to Tsugaru, Japan from July 26 – August 5, 2013! There will be an informational meeting this Wednesday, March 27 at 6:30PM at Bath Middle School, 6 Old Brunswick Rd., Bath ME! Record High Snowfall in Aomori, Japan! 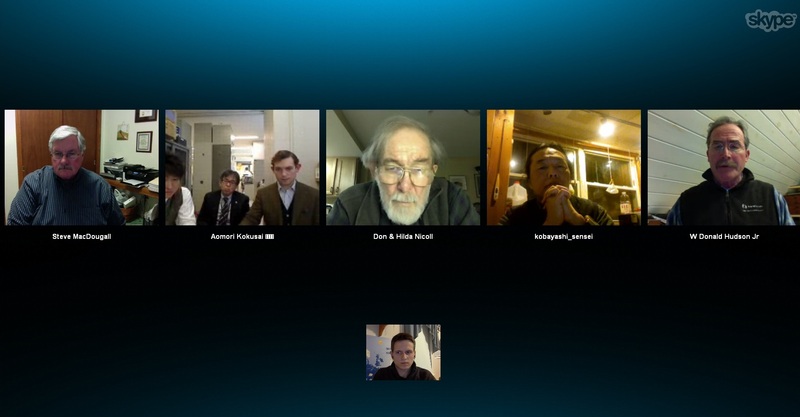 On January 28, 2013, MASSAC had another Skype Meeting with our dear friends over in Aomori, Japan! In this meeting, we discussed the two upcoming delegations this year — the Education/Arts & Culture delegation scheduled for mid-July and the Energy/Fisheries delegation scheduled for the Fall. Our next Skype Meeting will be in late-March, where we will solidify the details for the upcoming July delegation. More updates and details about this year’s trips are coming soon! Friends of Aomori & Maine-Aomori Sister-State Advisory Council’s New Website! Welcome to the new website for MASSAC and Friends of Aomori! Friends of Aomori and MASSAC are groups that specialize in facilitating and encouraging the educational, cultural, and business/trade relationships between the State of Maine and Aomori Prefecture, Japan! Every other year, the State of Maine sends many delegates from various areas of arts, education, and business to Japan. The years in-between the delegations, we host a delegation from Aomori in Maine. We are currently planning two Maine delegations to go to Japan this year 2013! This summer, we will be sending an education and arts/culture delegation consisting of some very dedicated people from Maine. In the fall, we will be sending representatives from Maine’s energy and fisheries industries, as well as researchers from Maine’s universities. Next year, it will be the 20th year anniversary of the Maine-Aomori sister-state relationship! We are very excited and honored to be hosting the Aomori delegation to Maine. We cannot wait to celebrate the success of the Aomori-Maine relationship, which is very important to us. More information on the 2013 and 2014 delegations will be coming soon! Please check out our delegations page to view annual trip reports of delegations in the past! The site is currently under development, but we will be fully up and running soon! Please revisit us!